When over $2 billion was pledged for the 2018 Yemen Humanitarian Response Plan (YHRP) earlier this year, it was considered not only a success but also the best funded response plan worldwide according to anonymous aid workers who spoke to the author during the UN General Assembly. So far, 65% of the pledged funds have been delivered. The delivery of the remaining funding is expected throughout this year. Despite all of the aid allocated to Yemen, the country remains the world’s largest humanitarian crisis. Famine-like conditions remain, while two-thirds of its roughly 29 million people need humanitarian assistance, and about 8 million people do not know where their next meal is coming from. Cholera and other infectious diseases continue to threaten millions of people amidst a collapsing health care system. While there are about 183 United Nations (UN) agencies and non-governmental organizations (NGO)s working together across Yemen’s 23 governorates, all coordinating together the delivery of humanitarian aid to millions of people, they are struggling to meet the people’s growing needs. Two major events this year have impacted the country’s massive humanitarian crisis. First, an on-and-off again battle in Hodeidah in May led to large numbers of civilian casualties, the displacement of thousands of people, the shelling of a World Food Program (WFP) warehouse, and threatened humanitarian assistance to the city and other neighbouring cities. A few weeks ago, the Yemeni Rial hit its lowest value in history. As a result, 3.5 million are food insecure due to high-cost basic food commodities and two million are at a heightened risk of famine. The humanitarian crisis is further exacerbated due to the conflict and the hurdles to conduct and maintain humanitarian work. “Since the Saudi-led coalition closed Sana’a airport, the only possible way to fly aid to Sana’a is through UN planes, which are often limited,” explains Patrik Olsson, Yemen Program Officer at the Swiss Agency for Development and Cooperation (SDC). 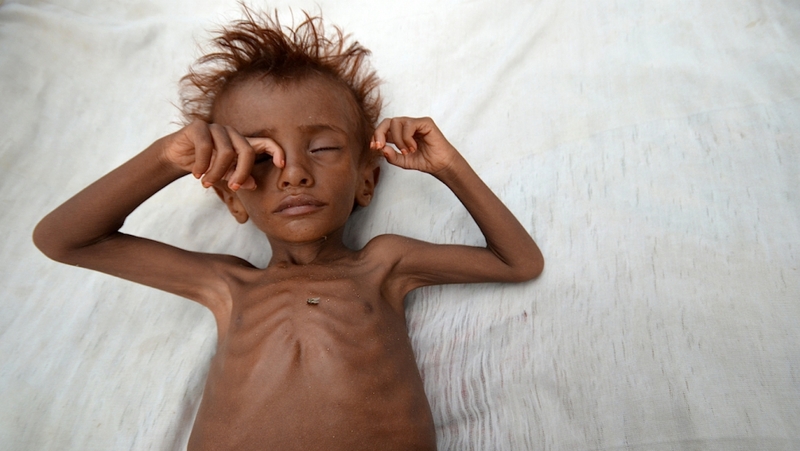 “Estimates put most of Yemen’s 29 million population in the northern part of the country. With limited access to the north, we are not able to provide the full extent of urgent assistance needed to the most vulnerable groups” says Olsson. Humanitarian work faces further structural problems that hinder or slow down the process. According to an anonymous aid worker, the Houthis’ de facto government in the north requires that transported aid be taxed—a process that slows down the distribution of humanitarian aid to vulnerable groups in northern areas. The fragmentation of the Yemeni state in the course of the ongoing conflict has allowed the emergence of other non-state actors who disrupt the work of international aid groups. For example, according to the UN Panel of Experts’ report, proxy forces of the Saudi-led coalition have obstructed humanitarian operations or the distribution of aid. Access to different areas across the country is also undermined by the spread of violence. For instance, after one of its staff was killed in Taiz last April, the International Red Cross pulled seventy-one staff members out of Yemen; impacting the crucial assistance it provides for people in need. Recently, Doctors without Borders had to suspend its activities in Ad Dhale governorate in southern Yemen following an attack against staff housing. Humanitarian access has been a major issue facing humanitarian actors. By February 2018 it was estimated that there were constraints in 90 per cent of districts in Yemen. This has required more humanitarian negotiation efforts to ease difficulties. Humanitarian diplomacy has been a key element in facilitating international humanitarian work in Yemen. “We work in a difficult operational environment; we are constantly involved in humanitarian negotiations with all warring sides to ensure we have full access and can assist the most vulnerable groups,” says the UN humanitarian aid worker in Sana’a. The WFP has managed to feed about eight million people per month, scaling up their targeted population of last year’s 3 million people. Among humanitarian aid workers, the consensus seems to be that the aid system is broken in Yemen. Those most in need rarely receive basic assistance due to the unique restrictions on all but one of the airports being closed, lengthy visa processes, obstruction of aid deliveries by regional state actors, as well as targeting of staff. Many of these limitations are not unusual to the providing of aid in a conflict zone, what is unique is that Yemen includes all of these factors in addition to being a poor population prior to the conflict with erratic media coverage. All these factors exacerbate conditions on the ground that aid workers continue to navigate seemingly with their hands tied behind their backs. This article was written for and published in The Atlantic Council's website today.